The glass/ cup filling & foil sealing machines available with us are durable in construction. These machines are highly efficient, long lasting, low power consuming and sturdy. Largely used by clients in food processing industry, these machines yield higher output to our clients across the globe. Associated Pack Tech Engineers, is a professionally managed company that is engaged in Manufacturing and Exporting an array of Sealing, Filling and Packaging Machines. We are equipped with advanced equipment, processing machineries and related tools to ensure that consistency is maintained in the quality of the product. 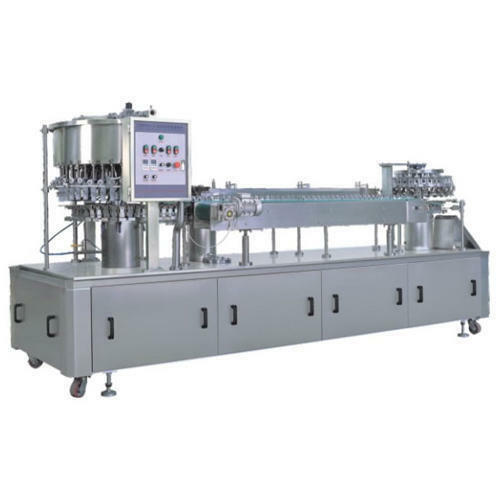 Our product range includes Pouch Packing Machine, Form Fill and Seal Machine, Automatic Bottle Rinsing Filling And Capping Machine, Rotary Bottle Filling Machine, Soda Filling and Screw Capping Machine, Semi Automatic Powder Filling Machine, Automatic Liquid Filling Machine, Glass Cup Filling and Foil Sealing Machine, Automatic Bottle Filling And Capping Machine, Automatic Sticker Labeling Machine, Automatic Tube Filling And Sealing Machines, Fully Automatic Cap Sealing Machine and many more. Our continuous hard work and commitment has enabled us to get to a step forward in exporting product all across the world. The testimony to our superior quality is our well-managed resources and innovative skills. Our entire product range is quality tested on various parameters before its final dispatch. For our client's convenience, the company offers excellent and prompt after-sales services, which include repairing, maintenance and installation.